MUJERES, OKAY MONDAY and WHATEVER will meet you on April 26th for an amazing show. 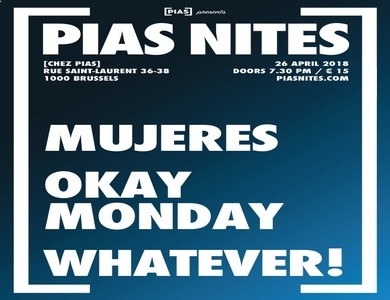 MUJERES, three spanish guys, who deliver punk/garage music, OKAY MONDAY, three french guys who deliver power pop songs and WHATEVER, three belgian guys, who deliver garage rock music. A sweet mix of musical diversity that will please the finest of ears. You don't want to miss that, trust me !